"A smart lock?! No, I'll never trust the security of my home to anything smart!" That was my thought until I sat down and considered the potential benefits: unlocking remotely for someone you trust (children who get home early from school, or visiting relatives waiting for you while you're stuck in traffic) or in case of emergency (fire, water leak), locking remotely if you forgot to or think you may have forgotten, checking the log of activity and being notified in case of suspicious unlocks, and the mere fact of using your keys less means you're less likely to lose or misplace them. Plus, if someone really wants to break into your house, other forms of forced entry are way easier than hacking a smart lock. If that made you reconsider smart locks or if you're already persuaded by their utility, then we've got a nice deal for you today. 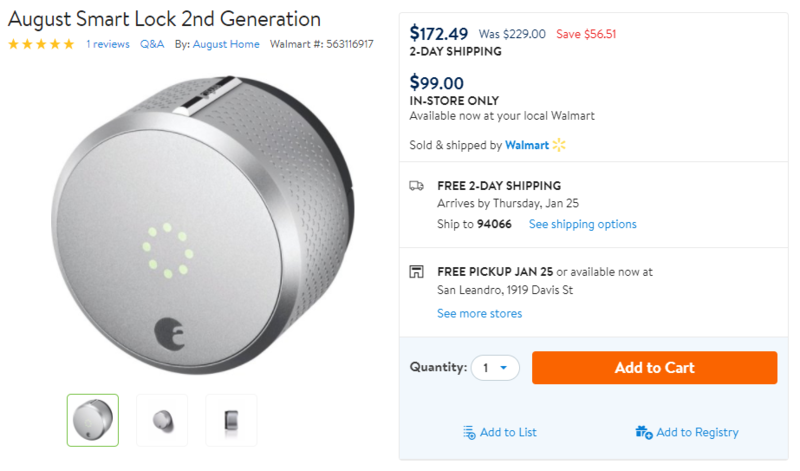 The 2nd generation August Smart Lock is down to $117 on Amazon and Best Buy. Even better, if you have a nearby Walmart, you can pick it up in store for $99. The original price is $229, but considering that this was on sale for $150 on Black Friday and has rarely dropped below $140, this is a very nice almost third-off discount. The August Smart Lock installs over your existing deadbolt and only replaces the inside part, so you can still lock/unlock with a key from the outside and you can manually turn it to lock/unlock from the inside. This one is Bluetooth-only and works with Android thanks to its app (and iOS too), but from what I read, you can control it well but auto-unlock seems to be very unreliable on Android. You may need to purchase the separate $60 or so August Wi-Fi Bridge so you can remotely unlock it, get a more reliable experience, and have support for Google Home (which is now native) and Alexa, but still, you'll be saving quite a bit with this discount. The 3rd gen August Smart Lock Pro is out, but that's still $230, making the 2nd generation half the price now and the all-around better deal.